Anyone who’s ever renovated a building in a tightly packed urban environment is well aware of the tough challenges that go along with it. Deliveries, material and equipment staging, planning, and scheduling, among other tasks, are all complicated by a confined worksite. So, just imagine the additional difficulties involved in renovating a midsize (meaning capacity for about 2,600 guests) cruise ship in a dry dock with a few cranes to load all supplies—with just eight to fourteen days to complete all items on a long project list, and only two opportunities to do this every five years. It’s these factors, says My Nguyen, deputy director of interior design and operations for Holland America Group, that make renovating a cruise ship—essentially a self-contained town that spends days at a time at sea—a unique undertaking. It takes an enormous amount of detailed planning and can be subject to innumerable glitches and delays, making this singular niche in the design and construction world one that’s not for the faint of heart. If you can succeed in it, Nguyen says, you can excel in many other construction markets. Nguyen is one of the niche’s top practitioners and helps Holland America and Seabourn maintain a fleet of 19 ships that together make more than 500 trips a year, visiting all seven continents. Both brands are unique—with vessels ranging from 600-guest ultra-luxury ships to 2,600-guest midsize cruise liners—but all their ships face the same challenges when it comes to renovation. To maximize profitability, the company works to keep the vessels in service for as many days as possible, so limiting their time in dry dock by performing renovations quickly is critical. Here, Nguyen breaks down the process in detail. “It takes about a year to successfully plan and complete a dry dock,” Nguyen says. The planning process begins with assessing what areas of the ship most need refreshing. Nguyen is responsible for all guest-facing areas such as state rooms, restaurants, bars, spas, fitness centers, casinos, and children’s play areas. The length of a planned dry-dock stay is a limiting factor. For example, with hundreds of suites and staterooms on each ship, it isn’t possible to renovate them all in a single stay of two weeks or less, so the renovations have to be performed in phases—typically no more than four of the eight passenger decks at a time. And, given the limited opportunities for renovations, Nguyen and her team spend a lot of time considering the durability of design materials. After they finalize their plans, though, they still face many more challenges. With as many as 50 subcontractors (about 15 for customer-facing spaces) working on the ship during each dry-dock stay, ensuring that they have the materials and tools they need on board at the right time requires military precision. Contract labor must also be carefully scheduled for the limited project window. A quirk of the cruise ship business is that much of the labor needed to renovate vessels is located where ships are usually built. So, Nguyen has to line up laborers from one or more of a few shipbuilding hot spots—such as Italy—months in advance. Additionally, cruise ships have different code requirements from buildings, including highly restrictive material-combustibility standards. (For instance, after a passenger ship fire in 2006, cruise lines had to replace plastic balcony dividers with aluminum dividers.) Thus, cruise ships have a limited number of vendors serving their market. When sourcing materials, Nguyen has to allow for longer lead times than on conventional construction projects to ensure that orders can be fulfilled on schedule. And vendors in turn must understand that marine construction demands hustle and the ability to fabricate material on time. As a ship enters the dry dock, all materials and workers—as many as 3,000 for a single dry-dock stay—should be ready for action. The big challenge is to transport all the materials and tools on board and have them in place when specific crews are scheduled to work. Shipyards typically have one to three cranes to service a ship in dry dock. The cranes are both indispensable tools and potential logistical bottlenecks, so sequencing onboard delivery efficiently is hugely critical. “You have to keep the tradespeople busy,” Nguyen says. “You don’t want them idle,” especially considering the overhead expense. 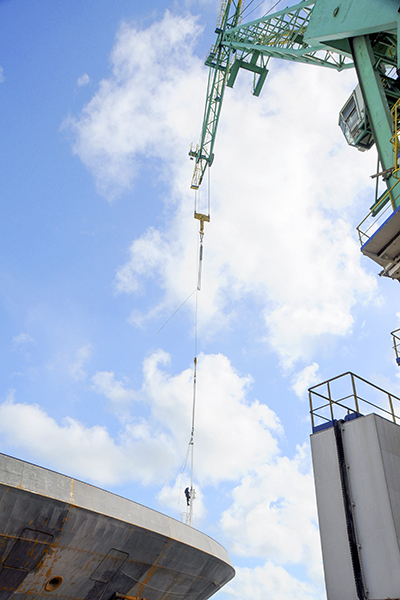 This requires careful planning regarding what goes in each container the crane hoists aboard. “You put materials and tools that each tradesperson needs for each part of the project in a container,” Nguyen says. Each contractor need not have all the materials for the entirety of their work, but each should have enough to get started, and then additional materials are delivered as the job progresses. “You don’t want to put all casework, carpet, and tools, for example, in a single container, in case the loading schedule gets delayed,” Nguyen says. “One thing you can predict in dry dock is that it is unpredictable,” Nguyen says. “Always plan for the worst.” Cranes can break down, for instance, which can be catastrophic to a project if a backup is not available. The company sometimes has to lease a floating crane on a barge when a shipyard crane fails. Also, material deliveries can be delayed for numerous reasons. A project schedule must therefore be flexible so that activity can be resequenced on the fly, and project managers, tradespeople, and logistics crews must be ready to adjust quickly. “Make sure you also inspect material on the shipyard before you do demo,” Nguyen says. For example, if you are replacing carpet, ensure that you have received the correct carpet and right amount of it before demo. It would be a major crisis if workers were to rip out carpeting, then find out later that the replacement material hasn’t arrived. To maximize efficiency at the job site, Nguyen leans heavily on prefabrication. Casework, bars, restaurant elements, and certain bathroom assemblies are often put together off-site to save time on onboard work. Whenever prefab is an option for a new element—such as recent new glass-feature walls for luxury suites—it’s usually the preferred choice. The size and shape of prefabricated elements are constrained by door and entryway openings, so prefab assemblies have to be designed accordingly. Nguyen adds that contractors should view it as a challenge. “Cruise ships are like hospitality projects on steroids,” she says. “There’s definitely a learning curve to consider.” But, once established in the marine market, design and construction firms can compete for a steady stream of work—and prove they have the ability to tackle any project in a restricted space.